How did you like that awesome teaser photo? I posted it on FB and tweeted it, and boy the "where is the recipe" comments flooded in! This is a bit of a repeat recipe, it is just doing something different. It is my Not Your Mom's Cinnamon Rolls recipe. 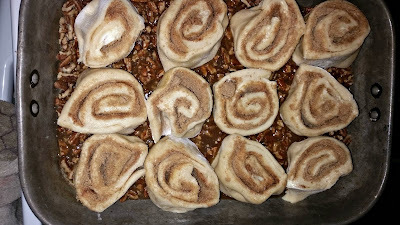 I will rewrite the recipe below, and then get on to the treatment of these lovely babies, that makes them sticky buns! Make these, freeze them, eat them, photograph them, just, for the love of food, make sure you share the love! I had been planning on making these awhile ago and for some reason just kept putting them off. Well, when I did make them, they were a hit, complete with moans, groans and "OMG's" That my friends is when you know you have hit the jackpot! In a measuring cup place hot water and 1 tsp sugar. Put a thermometer in it and if it is to hot, wait for it to cool to 110-115 degrees. I know some people say they always kill the yeast so better to have it to hot and have to wait for it to cool a bit. I do it like this and just wait for it to get to the temp I want! When it gets to the correct temperature add in your packet of yeast, give it a tiny stir and remove thermometer. Let sit 3-4 minutes. It should get foamy on the top! Now in a bowl or stand mixer (using your dough hook) add in the egg, milk, melted butter, sugar and salt. Mix until combined. 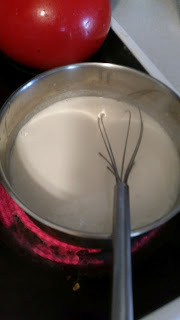 Now add in the yeast mixture, flour, cinnamon, and vanilla. I mig ht have slipped and added extra vanilla too! I always do, you know that! HA! Now once you get it all combined, by hand or machine, either knead it for 3-4 minutes until smooth, or let it go in the stand mixer the same amount of time, or until smooth. 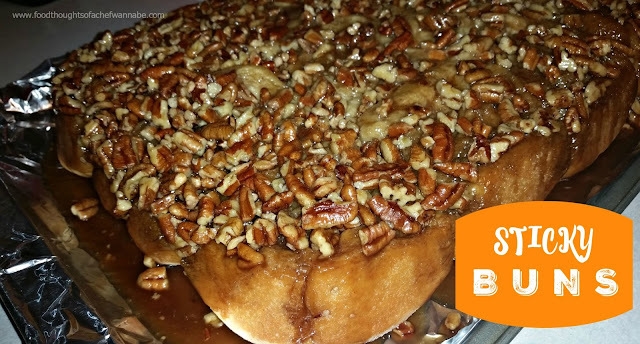 Turn the dough out into a buttered, or sprayed with non stick cooking spray, or oiled bowl. Cover tightly with plastic wrap and sit in a warm, draft free place. Sometimes I turn the oven on to preheat for baking and set the bowl on the stove top. This could take an hour, or it could take 3 hours. The warmer the area, the faster it will happen. It should about double in size! Spread the butter over the dough, make sure to get it covered everywhere! Sprinkle brown sugar evenly and then the cinnamon. Roll up the dough into a log. 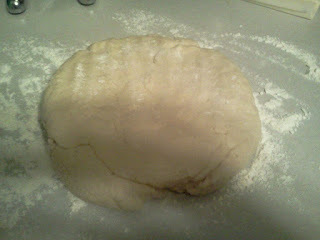 Pinch the dough to seal it all the way across, flip so the seam side is down and set aside. Spray your 9x13 with nonstick cooking spray. Set aside and combine the following ingredients in a small pot. 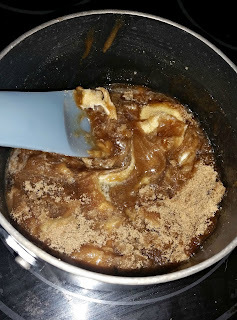 Let heat until brown sugar is dissolved, stirring constantly. Then pour into your prepared 9x13 pan and spread evenly. Cut your roll of rolls into 12 rolls. Place in the pan on top of the sticky topping. Cover and let raise until they have nearly doubled in size and then bake for 30 minutes at 350 degrees F.
Let cool for 2 minutes only! Turn upside down on a large tray or cookie sheet and let sit for a couple of minutes before lifting the pan off the top. Waaaaa-laaaa! 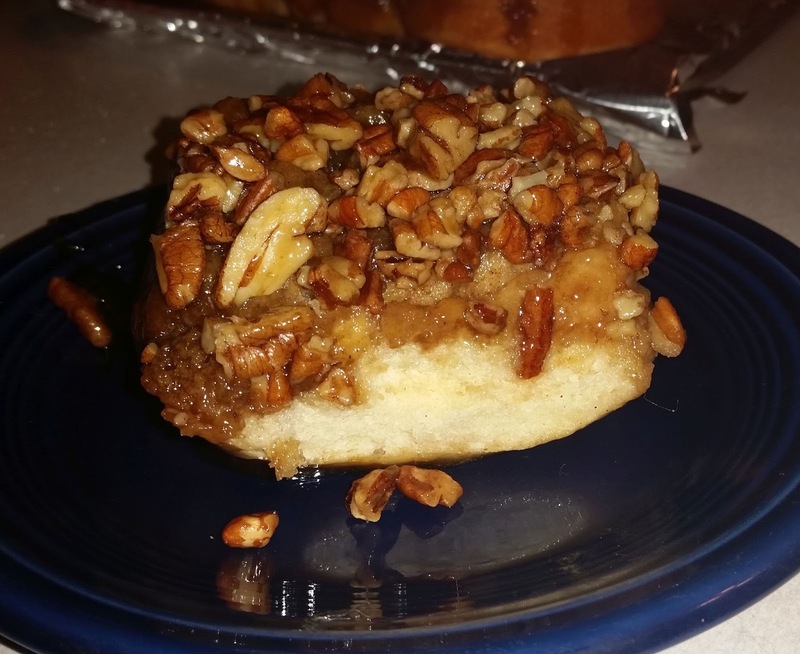 Perfect sticky buns! Happy Spring! It finally feels like spring! I shouldn't speak up so fast, it could be snowing tomorrow, but right now....awesome! This is a recipe my husband has been wanting me to work up for awhile now. This is the first recipe I have made since losing my mom. I think she brought me good luck, it was amazing. He told me what he was thinking, I wrote down a tentative recipe, and nailed it. I am going to make it again this week, because, well, it was THAT awesome. Have you ever put food in your mouth that made you close your eyes and just soak it in? This is that food. I swear. This seems like a bit of a hassle but it really isn't, I just wanted to be as thorough as possible for any new cooks wanting to try it. Did I mention it felt awesome to be back in the kitchen? Thank you ALL for your private messages, emails, tweets, etc, they made my heart joyful, and thankful. I am so blessed to call you all my friends. 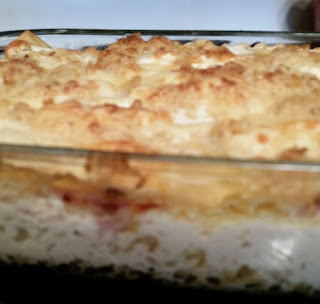 Enjoy this lasagna, and if you make it, tweet me, post it on Facebook, tag me in your Instagram photos, all of it! Did I mention to NOT skip the topping? The crunchy, delicious, almost just want to eat it off the whole thing, crunchy top. YES!!!! Preheat your oven to 350 degrees F. Spray 9x13 pan with nonstick spray or butter it and set aside. In a medium pot, poach chicken breasts. 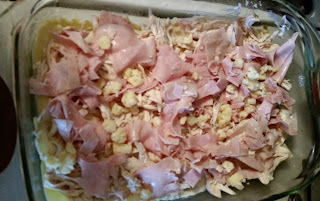 If you have leftover chicken or want to roast it, go for it, but I poached mine. When they are done, remove from water and set aside to cool. Take your deli meat and give it a slice, into strips. No science here, I just cut mine all at the same time into smaller pieces, 3 or 4 cuts top to bottom and it was perfect. When the chicken cools at some point during this process, just shred it. Cook your lasagna noodles. Just follow package directions, you will only need about 9 noodles. Make them all, and let your husband use the rest for buttered noodles. (yes, I am a fabulous wife) Drain and rinse in cold water to stop the cooking and to be able to handle them without visiting a burn unit. Time for that cheese sauce! In a large-ish pot, melt your butter, add flour and stir to let the flour cook for a minute or two. Slowly whisk in your half and half. When it begins to boil, add in HALF of your grated cheese. Stir until melted and thickened. Now, set that aside so we can assemble this bad boy. 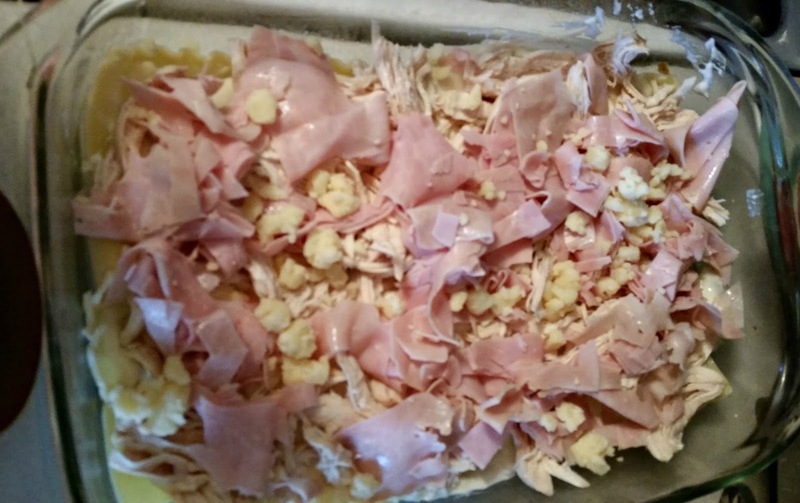 Lay down 3 noodles to cover the bottom, now add 1/3 of your cheese sauce, half of your chicken and half of your ham. Just cover it evenly. Now take 1/3 of your remaining shredded Swiss and sprinkle that over it all, then back to the noodles. Rinse and repeat. When you put your next layer of noodles on (the last layer) you should have a bit of your cheese sauce and shredded cheese left. Now STOP. In a small bowl melt your 4 tbsp. butter. When it is melted and slightly cooled, add in bread crumbs and remaining shredded cheese. To finish the top, pour and spread over the remaining cheese sauce, and then sprinkle buttered breadcrumb/cheese mixture on top. Trust me on this one. Bake for 30 minutes at 350 degrees, then 15 more minutes at 375. Perfection. Just, perfect perfection. 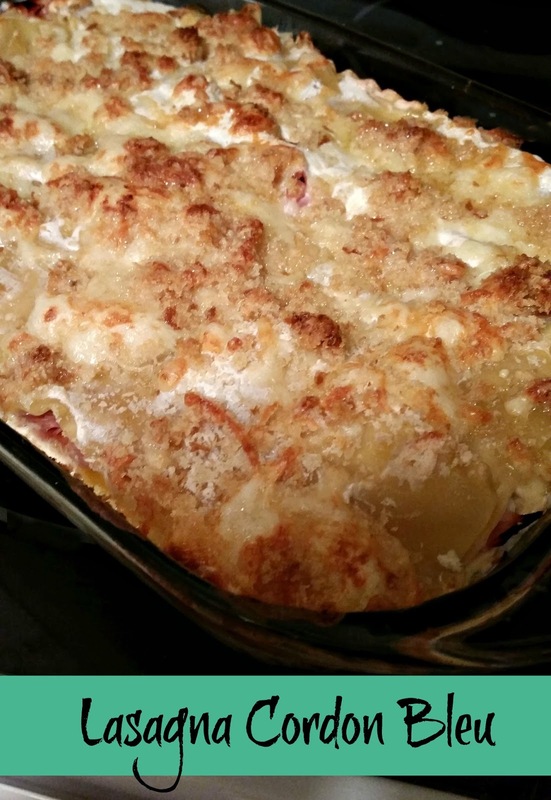 If you love Chicken Cordon Bleu, and you love pasta, this might be your most perfect culinary dream! PS. Excuse these photos. I used my phone, it is a long story but, back to regular photos next time!